My TV is on in the background again and today is Mike Franks marathon day on NCIS. One of favorite characters. I'm listening to Bonnie Tyler - It's A Heartache . I guess I too am pretty eclectic in my listening. I hit the gambit from Jesse Cook, to Nina Simone, to Massive Attack to David Crowder. Right now, I was just listened to Sinnerman recorded by Nina Simone. You might recognize it from one of my favorite movie scenes of all time in the Thomas Crown Affair. I have a need to hear some songs from my youth so here is one by the Troggs - Love is All Around. 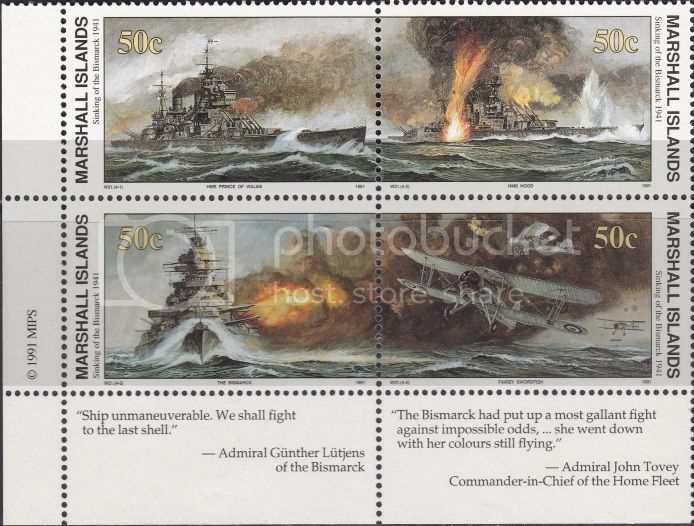 I was going through my Marshall Islands stamps and came across a block of stamps depicting the Bismarck, Hood and Prince of Wales so I thought it was appropriate to show you the stamps and let you listen to a great song by Johnny Horton - Sink the Bismarck. one of my favorite songs, but then anything by Johnny Horton is a good song. 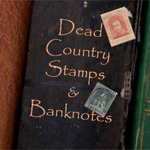 I don`t listen to music while stamping. kacyds, seeing that you are listening to the rain, I thought you would like this CCR song _ Have You Ever Seen The Rain. I`m listening to the album The Intimate Jim Reeves. currently, i have a recording of my wife playing rochberg's sonata for viola and piano playing on my ipod (my wife playing viola). sadly, there is no youtube video. maybe i can convince her to upload the video??? let's keep our fingers crossed! I for one would love to see a video of that. Hope you can convince her to upload it. i wish she had more confidence in her ability. she won't go public with it, and if i were to upload it without her permission, well... keep hoping, and i will keep trying to get it on youtube! to be responsible for perpetuating such stuff!